Located along the shore of Yellowstone Lake in the West Thumb Geyser Basin, Fishing Cone is a now-dormant geyser cone that caught the attention of Yellowstone's early explorers. 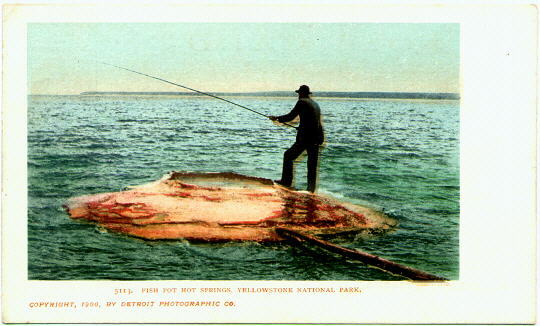 Later tourists delighted in catching fish from Yellowstone Lake and without taking them off the hook, dropping them in the cone to parboil, sometimes posing for pictures in a cook's hat and apron. Aside from the damage walking on this themal feature may have caused or one's point of view on the ethics of putting a live fish suddenly in scalding water, the whole concept was not a good idea. At least one tourist was injured by a sudden eruption, and it has been determined that cooking fish in this manner does not cook them thoroughly enough to kill all bacteria. 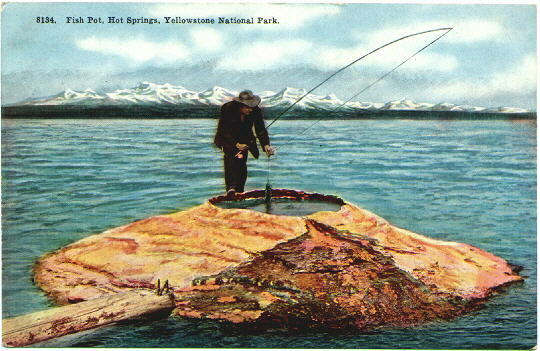 Fishing Cone has gone by several names including Fish Pot and Hot Spring Cone. During the early summer it is usually covered with water, but becomes exposed as the summer progresses. When active, eruptions have reached 3 feet and lasted from minutes to hours. 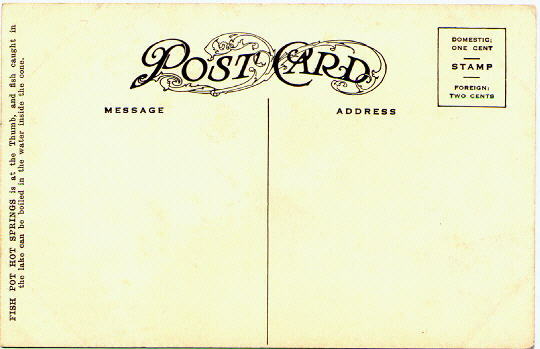 The manufacturer of the postcard above was not identified. Below is an older, undivided back Detroit Photographic Co. card with a copyright date of 1900.